The Carriage House and gardens are available for weddings and horticultural association meetings at a modest rental fee. Please plan ahead. Our calendar is crowded. Contact us at info@edgertonpark.org for information on availability and pricing. These gardens, originally developed by the Pardee Garden Club, are today a favorite place for weddings. The Carriage House is part of the package. The Great Lawn is the site of the Brewster Mansion. The house overlooked the fountain and faced East Rock. Today the lawn is the site of “Sunday in the Park” and Elm Shakespeare’s productions in the late summer. The fountain is located in the center of the park and is a lovely setting for wedding photographs. The dell is the low area to the east of the fountain. It is home to the annual New Haven Folk Festival. In the winter, it is a favorite hill for sledding. 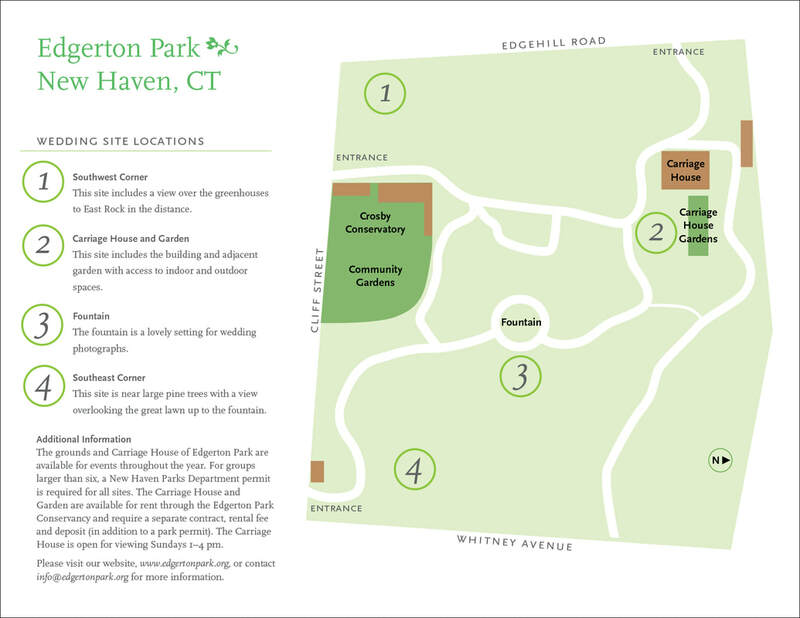 Click on the map below for a printable pdf of wedding site locations.